In a Car Accident in North Carolina? Everything You Need to Know. Have You Been in a Car Accident in North Carolina? Here is What You Need to Know. Getting into a car accident is a horrible, traumatic event even if you don’t sustain serious injuries. And if you or someone you loved were seriously injured, the impacts can be even worse. The purpose of this car accident guide is to help you understand everything you need to know if you were in a car accident, from how to file your claim to how much money you can get for your injuries, to when you need to file your claim. This post is a work in progress, and we will continue to add to it on a regular basis until it is completed. 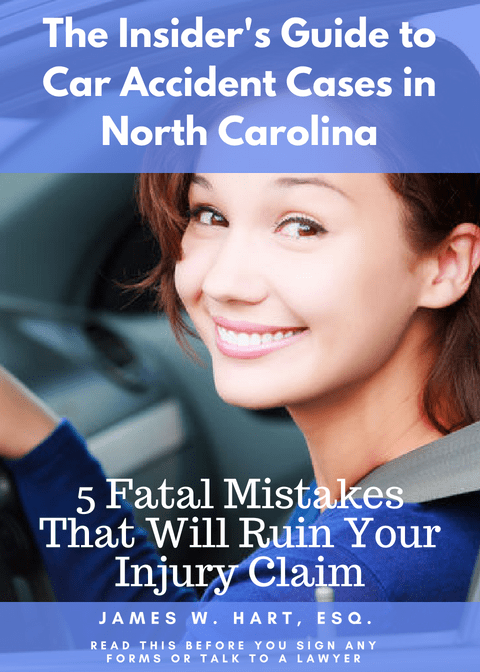 Once finished, this will be one of the most comprehensive blog posts on car accidents in North Carolina. As always, if you have any questions or would just like to talk to a car accident lawyer about your specific situation, please feel free to contact our office at (919) 887-8582 or complete our online contact form. How much Money can You get for Your Car Accident? How Do I Get the Most Money Possible for My Car Accident Claim? How can I find out exactly how much money I deserve? What is the Average Payout for a Car Accident Claim? How Much is Your Car Accident Claim Really Worth? What is Average Car Accident Settlement? Where does the Average Auto Accident Settlement Payment Come From? When Should You call a Lawyer for Your Car Accident? The amount of money you can recover for your injuries in a car accident in North Carolina will vary depending on the extent of your injuries and other factors. However, you should be aware that except for in very rare circumstances, to recover money damages if you have been in a car accident, you must not have been at fault for the accident. This is because of a legal doctrine called contributory negligence. Without going into the nuts and bolts of contributory negligence in this article, all you really need to know is that if you weren’t the person responsible for the car accident, then you can recover financial compensation, or money to compensate you for injuries. But exactly “how much money” can you recover is what you really want to know. The amount of money you can recover will vary greatly, from virtually nothing (for minor crashes) to a substantial amount of money where there were significant injuries. Reimbursement for your time out of work, including past and future lost wages, due to the accident or your resulting medical treatment. All of the above damages are considered your “special damages” and are connected to a fixed dollar amount or financial loss. However, you may have other damages that aren’t so easy to calculate with a fixed dollar amount. These damages include your “pain and suffering” and could include things like the pain you felt (and continue to endure) as a result of a broken arm, a lost limb or a permanent disability. And while this extra compensation cannot ever replace your physical losses, it will help to lessen the financial impact of your injuries. Depending on the severity of your injuries, this could amount to a few thousand dollars or substantially more if you experienced a life-altering injury. In order to determine how much money or compensation you are entitled to, you must gather all of your actual bills related to the accident and add those to the compensation you lost from time off of work. This will provide you with a baseline of special damages that you will be entitled to. Any pain and suffering you have and will continue to endure will be added to the amount of your special damages to determine the total value of your claim. In a perfect world, to recover for your car accident claim, you would submit your claim and paperwork to the insurance company, provide them information about your injuries, and they would write you a check for the full amount you are entitled to under the laws of North Carolina. However, our “world” is run by for-profit entities that are known as insurance companies. Claiming that you caused or were partially to blame for the accident. In North Carolina, if you were even 1% at fault for the accident (i.e. you were contributorily negligent), then you are not permitted to recover any financial compensation. While there are some exceptions to this rule, if the insurance company is denying your claim because of contributory negligence, you should talk to a car accident lawyer. Disputing your injuries. It’s a despicable practice, but frequently the insurance adjuster will try to minimize your injuries or even argue that certain treatments weren’t medically necessary. They may even claim that certain injuries weren’t even caused by the accident and therefore are not covered. Befriending You. Believe it or not, the insurance adjuster will often try to befriend you in an effort to gain your trust and let them know they are on “your side.” This may keep you from hiring a lawyer and as a result will help to minimize the value of your claim. The best way to fight the insurance companies is to hire a lawyer to help you navigate the minefield that is your car accident claim. The insurance companies will hire the best and brightest lawyers to represent their interests and these lawyers know how to attack your claim and minimize the amount of money the insurance companies will pay. The only way to level the playing field with these well-funded corporations is to hire your own lawyer to fight for your interests. An experienced car accident lawyer will know how to position your case to maximize its settlement value, gather evidence and witnesses, and prepare your case for trial if necessary. Having a lawyer on your side will allow you to focus on your medical care and treatment, not negotiating with an insurance company in a process that you know little about. Perhaps a better way to ask this question is “how can I find out how much money I am legally entitled to?” And the best answer is that you will need to talk to a car accident lawyer who can look at the facts and circumstances that surround your case, review your medical records, and give you an honest written assessment of what your case is worth. Most lawyers are unwilling to provide a written assessment. Instead, they will have you come in for an initial consultation and then, based on a short conversation with you, tell you what they think your case might be worth. This dollar amount could be high, or it could be low. In our opinion, assessing the value of a case after one meeting with you is not only improper, but is borderline unethical. At The Hart Law Firm, we will wait until you have finished your medical treatment to assess your case. At that point, we will have had time to contact witnesses, review your medical records and bills, determine what expert witnesses may be necessary to prepare your case for trial, and review your income information. Then, and only then, can we provide you with a written assessment of what your case is worth prior to sending out a demand package to the insurance adjuster. By providing this service, you will have a better understanding of a proper settlement range for your case. [/et_pb_text][et_pb_cta title=”Need Answers About Your Situation?” button_url=”http://jameshartlaw.com/contact” url_new_window=”on” button_text=”Find Out if You Have a Case” _builder_version=”3.15″]Have you been involved in a car accident in North Carolina? Do you have questions about what your claim might be worth? Click below to start an investigation with us. We’ll help you get answers to your questions. We wish determining the amount of money you will receive in a car accident case were as easy plugging your personal information into a computer and getting a printout of the amount of money you will receive. If things were that easy, you wouldn’t need a car accident lawyer to help you. Unfortunately, no two cases are the same, and there is no way to truly understand how much money your case is worth without having a car accident lawyer review your file after you have finished your medical treatment. There are two types of damages in North Carolina car accident cases – special damages and general damages. Special damages are also known as “economic damages” and cover things such as your medical bills, lost wages, property damage, etc. These damages are fairly easy to calculate and are relatively straightforward. On the other hand, general damages (also known as pain and suffering) are much harder to estimate. There is no set formula for general damages in North Carolina. Sometimes people use a formula such as a multiple of your medical bills. This multiple, if applied to your case, can vary based on the extent of your injuries and your future prognosis. Pain and suffering is a large unknown, and experienced car accident lawyers will take into account similar jury verdicts in your county, your personal employment history, whether or not you were “contributorily negligent” in causing the accident, the nature and extent of your injuries, and other factors to determine an appropriate valuation for your general damages. In generally, we will not settle your case, and in fact we will not even send out a settlement demand on your case until after you have finished your medical treatment and have reached what is considered maximum medical improvement, or MMI. This can typically take anywhere from several months to a year or longer, depending on the nature and extent of your injuries. One of the great things about car accident cases is that you don’t need to pay a lawyer up-front to handle your case. Instead, lawyers will accept what is commonly referred to as a “contingent fee”. That means that our legal fee is contingent on the job we do for you. The more money we recover for your claim, the more we get paid. For many car accident lawyers in North Carolina, that fee will range from 33-40% of your final settlement amount. However, not surprisingly, we are not like most car accident lawyers. At The Hart Law Firm, we charge a 25% fee if your case settles prior to filing a lawsuit, 30% if we need to file a lawsuit, and 35% if your case settles within 90 days of trial. In addition, if you hire us to review a settlement offer you have already received, we will only charge you on the amount we are able to recover for you over and above the amount already offered by the insurance company. The most common objection we hear from client’s is, “can’t I just handle this on my own? Do I need to hire a car accident lawyer?” And you certainly can try to represent yourself, but we don’t recommend it. A car accident claim is extremely complex and if not handled properly, from the beginning, can end up costing you thousands of dollars and potentially much more. The insurance companies spend billions of dollars each year on marketing campaigns, lobbyists, and corporate lawyer, all in an effort to minimize the amount of money they pay out in claims. They want you to believe that they are your friends, and will go to great lengths to influence you so that you will not hire a lawyer. They will try to convince you that you are wasting your money by hiring a lawyer. When you start negotiating with them, they will play the role of doctor and tell you that your medical treatment is unnecessary or unwarranted. They will try to convince you to go back to work before you are medically cleared to do so. When you are considering whether to hire a car accident lawyer, you must ask yourself, is the insurance adjuster really on “your side” or are they looking out for what is in the insurance companies best interests? Depending on your injuries, your case is probably worth more than you think, and it certainly worth more than the insurance company is telling you that it is. Talk to a Cary car accident lawyer today and learn more about your rights. To determine the total settlement value of your accident, you will add up all of your medical bills, car repair bills, prescription costs, lost income from being unable to work, cost of your rental car, and an estimate of your pain and suffering. In other words, you will add together your special damages and your general damages. This will give you a rough estimate of the total settlement value for your case. It goes without saying that the value of your pain and suffering (i.e. general damages) will be the biggest unknown. Here are several ways you can estimate the value of your general damages. There are numerous ways to calculate pain and suffering. Below we’ve outlined two of the most common methods. As car accident lawyers, we will also frequently conduct jury research to see how juries have handled similar injuries and accidents in the past. The two main methods for estimating pain and suffering are the multiplier method and the per diem method. One of the most common ways to estimate a value for your pain and suffering is by using the multiplier method. With this method you will multiply your expenses related to your medical bills, lost wages, and other out of pocket expenses, by a multiple of anywhere from 2 – 5. The multiple will depend on the facts surrounding the accident, the severity of your injuries, and your future prognosis. The worse your injury, the higher the multiple. For example, let’s say you were rear-ended and suffered a neck injury. You were out of work for a couple weeks which cost you $2,500, and your total medical bills were approximately $5,000. You had property damage and other miscellaneous expenses that totaled an additional $1,750. The total value of your special damages was $9,250. Your total compensation would range from 2x to 5x your special damages, or somewhere between $18,500 to $46,250. Was the other driver drunk at the time of the accident or under the influence of any other form of drugs? How severe were your injuries? Did you suffer only a soft tissue injury or did you break any bones or tear ligaments or tendons? Did you lose the use of any limbs as a result of the accident? Did you require surgery or extended time off of work? What is your prognosis for recovery? Are your injuries permanent or just temporary? Did you suffer any permanent scarring or disfigurement as a result of the accident? When applying a multiple to a case, it is important to use some common sense. Some people suffer relatively minor injuries, but have higher medical expenses – this is frequent in soft tissue cases where repeated therapies and treatments are necessary to alleviate pain while you heal from the injury. In these cases, a lower multiple is appropriate. On the other hand, there are situations where the injury could be more severe, but the medical bills are lower because repeated follow-up appointments are not necessary. In those situations, a higher multiple may be more appropriate. The “per diem” rate is another way to estimate the value of your pain and suffering. The per diem method will assign a daily dollar amount to your pain and suffering, say $100. This means that for every day that you experienced pain as a result of your injuries, you claim an additional $100 in damages. If you were in pain for 6 months from the date of your injury, then your total per diem damages would be 180 x $100, or $18,000. This would be added to your special damages to determine a total amount of compensation for your case. One of the nice things about the per diem method is that it is easy to understand. If you have to go to court and explain to the judge why you are seeking a certain amount in damages, it is much easier to explain the per diem method of damages than it is to argue that you should be entitled to a multiple of your special damages. Probably the best way to properly evaluate the settlement value of your case is to use a combination of multiples and per diem to determine an appropriate and fair settlement amount for your case. In every case, we start with the value of the special damages. After we have a good handle of what those damages are, we will work with our clients to determine what a fair amount for pain and suffering is. One of the major benefits to working with a car accident lawyer is that we can help you to properly evaluate the settlement value of your claim. Working by yourself, you may undervalue or in some cases, overvalue the amount that your claim is worth. #1: Conduct a complete and thorough investigation. It is imperative that you collect as much information as you possibly can about the accident. Witness statements, police reports, and even recordings from traffic cameras are all important. Consider installing a “dash cam” in your car to record what you saw before the accident and even the accident itself. In some cases, you may need to hire a private investigator to help you or even an accident reconstruction expert. These professionals can help you to gather information and even safeguard physical evidence from the scene. Be assured that the at fault driver’s insurance company is doing all of this behind the scenes, without telling you. If you don’t conduct your own complete investigation you could find yourself at a serious disadvantage. #2: Take pictures and/or videos of everything: You should take pictures or video of your car, the car that hit you, your injuries, the overall scene of the accident, etc. This is easier than ever with the cameras on our smart phones. If you don’t have a smart phone, you should keep a disposable camera in your glove box. Photographic evidence can be very persuasive to show a jury what the accident looked like. #3: Don’t sign anything or release any records to the other party’s insurance company. A huge mistake we see clients make is to sign a medical release giving their medical records to the other driver’s insurance company. In North Carolina, the only instance where you should do this is if you are requesting the policy limits for the other party’s insurance. In that case you could be required by law to sign a release. But in many other cases, you should not release your medical records to the other party’s insurance company. The adjuster will tell you that they need this information to process your claim, but that is nonsense. They want this information to use against you or to give them information they need to deny or minimize your claim. Don’t do this. #4: Don’t feel pressured to resolve your case. We’ve mentioned this on multiple times before – the insurance adjuster is not your friend, but they will act like they are. They befriend you because they know that if you like and trust them, you will give them a lot more information about your situation. In addition, you will be less likely to hire a lawyer to help you because they will make you believe that you don’t need one. Once you let your guard down, the adjuster will use tricky methods to get you to agree that the accident was at least partially your fault – which is the kiss of death to your claim in North Carolina because of contributory negligence. They may get you to give a written or a recorded statement that can be used against you later on if your case goes to trial. The adjuster’s primary goal is to get you to settle your case quickly, BEFORE you contact or hire a lawyer. They know that clients who have lawyers will receive better results on their case – and they want to minimize the settlement in your case. The best way to do that is to keep you from calling a lawyer. Don’t fall victim to their tactics. Recognize these tricks when you see them and call a lawyer for help. #5: Keep a daily journal of your injuries. In the event you end up in a courtroom, which is unlikely but also very possible, having a daily journal that discusses how you were feeling, your pain level (scale of 1-10), whether you were having headaches or muscle spasms, how your injuries affected your daily life, etc. is very helpful. In the event you need to testify about your injuries and how you were feeling on any given day, a journal can be very helpful. Here is a specialized personal injury journal you can use for this purpose. #6: Know your damages. Here is a quick list of the types of damages typical in a car accident case: (1) bills related to your medical care and treatment; (2) property damage to your car; (3) lost income for time off of work; (4) cost of a rental car or hiring a taxi service; (5) loss of consortium; (6) cost to hire at-home help, such as a housekeeper, cook, or someone to mow your lawn; (7) pain and suffering for your injuries; (8) cost of prescription medication; (9) co-pays for ongoing medical or chiropractic visits; and, (10) any other out of pocket or other expenses that resulted from your injuries. #7: Keep all bills and receipts related to your accident. Just as it is important to keep a personal injury journal, you should also keep a folder for all of your bills and receipts related to your accident. Without this information, it becomes harder to prove your total damages. Some of the items you may need include doctor or hospital bills, receipts from the pharmacy, parking receipts for medical appointments, cost of medical devices, and any other related bills that you incurred because of your accident. #8: Know all of your injuries. One of the reasons we like our clients to wait for several months to settle their claims is that they may not know the full extent of their injuries for many weeks or longer. Just because it doesn’t hurt immediately after the accident doesn’t mean there isn’t an injury. Some injuries just take longer to manifest themselves. Some victims may suffer from psychological trauma such as Post Traumatic Stress Disorder (PTSD), which will make it harder to cope with the normal activities of daily living and other daily stresses that tend to become more difficult after a traumatic accident. If you sense something is wrong, talk to your car accident lawyer to determine what you should do or who you should see about your injuries. #9: Know where the insurance is. In order to recover for your personal injuries related to a car accident, you need to know where the insurance is. Many people wrongfully believe that to recover for their injuries, the at fault driver is the one who will be paying them. This is incorrect – it is their insurance company that will be paying the settlement. But you need to know what insurance is available. In many cases, there may be multiple sources of insurance available, including from your own uninsured or underinsured motorist policy. Managing the multiple sources of insurance is something that a car accident lawyer can help you with. #10: Don’t stop treating until your doctor releases you. At some point you will (hopefully) start to feel better and you may feel that you don’t need any further treatment. But don’t make the mistake that many people do – they stop going to the doctor when they start to feel better. You need to continue treating with your doctor until they determine that you are at maximum medical improvement and release you from their care. If you can’t afford the continuing cost of treatment, call our office – we may be able to negotiate a medical lien on your behalf. Alternatively, you should make sure you have exhausted all of your medical payments coverage (aka med pay) on your insurance policy. #11: File your lawsuit as soon as possible. As a victim in a car accident case, you are in the driver’s seat (no pun intended) when it comes to your settlement options. Although it may not feel this way when you are going through this process, you have quite a bit of control over when and how your case will ultimately settle. Here’s why – the insurance company wants you to settle quickly and for a dollar amount that is far less than what your case is actually worth. They want information from you including your written or recorded statement, your medical records, your income information, etc. You don’t have an obligation or duty to provide them with anything. Depending on the case, we may send a written settlement demand package with a limited amount of information so that the insurance adjuster can evaluate your case and negotiate a settlement, or we may simply file a lawsuit without sending anything to the adjuster. We like to keep the insurance company on the defensive – which gives us the leverage we need to settle your case. Insurance companies have a strange way of settling a case when they know that a court date may be approaching. Filing a lawsuit will put pressure on them to get serious. #12: Ask a qualified car accident lawyer to evaluate your case. If you have a medical condition, you go to the doctor. If your car breaks down, you go to see a mechanic. Doesn’t it make sense that if you are in a serious car accident that you should go see a lawyer who can evaluate your claim and counsel you on how to proceed? As mentioned before, the insurance company wants you to settle your case quickly without talking to a lawyer. As car accident lawyers, we can review your file, look at your police report, medical bills, lost wage information, and other documents. After reviewing the evidence related to your case and discussing the situation with you, we can talk to you about next steps and what you should or shouldn’t be doing to maximize the value of your claim. At the conclusion of your medical treatment, our office will provide you with a written evaluation of your claim, including strengths, weaknesses, and projected settlement valuations. The amount of insurance that is available to pay the claim. So as you can see, the amount of the average car accident claim can vary greatly. In addition to all of the above referenced factors, you will also need to take into account the population (i.e. the jury pool) in the county where the accident took place. Here in North Carolina, some of the rural counties will produce very conservative juries who are likely to return a smaller verdict than some of the more populous counties. The money to pay a car accident claim comes from the auto insurance that you and every other driver in North Carolina is required to purchase when you get a driver’s license. The minimum amount of coverage that you must purchase is $30,000 of bodily injury for each person, $60,000 of bodily injury for the entire accident, and $25,000 for property damage. Your North Carolina policy must by law also include underinsured and uninsured motorist coverage. Many policies have much higher limits, and we recommend that all of our clients purchase the largest automobile policy that they can afford. To understand how this works in practice, let’s take an example. Assume that you were in an accident with significant injuries. You had to miss several months of work and your medical bills were $30,000. A $100,000 settlement would not be unreasonable in your case. When you make a demand to the other insurance company, you determine that the other driver was only carrying the minimum insurance. Therefore, you will receive $30,000 from the at fault driver’s insurance policy, plus the cost to repair or replace your vehicle up to $25,000. What about the other $70,000? Underinsured Motorists (UIM) Coverage will provide protection when an underinsured driver, who is at-fault, causes injury to a covered individual. An underinsured driver is one whose limits of liability are less than your UIM limits, and not enough to cover the losses of the people the underinsured driver injures in an accident. What this means is that if you carried enough UM/UIM coverage on your policy, then your policy would pay the difference (assuming your adjuster accepts the claim as well). However, if you only had the minimum amount on your insurance, then there is no difference between the limits of the other driver’s policy and your UIM coverage, so your policy would pay nothing. If you had $60,000 of UIM coverage, then your policy would pay an additional $30,000 (to make up the difference). This still leaves $40,000 that is unaccounted for. To recover these damages, you could either sue the other driver and attempt to recover those funds from him or her personally, or you just accept what the insurance company offers to be done with the case. There is another component that could help you in this situation. In North Carolina you can also purchase what is called MedPay or Medical Payments coverage. We highly recommend that you purchase as much of this coverage as you possibly can. MedPay will pay your reasonable and necessary medical expenses due to an automobile accident up to the limits listed in your policy. So if you had $100,000 of MedPay on your policy, then in the above example, this benefit would kick in and pay $30,000 of your medical bills. And since MedPay is a form of “no-fault” insurance, you won’t need to wait for that payment – you will receive a claim number after your accident from your insurance company and they will pay for approved medical expenses. An added benefit to MedPay is that it doesn’t need to be paid back when you settle your claim, unlike traditional health insurance. There are many people who believe that they can save money and manage their own car accident claim without hiring a lawyer. In certain cases, this may be true. If you have minor injuries, very little property damage (under $1,000), and missed less than a week of work, then you could probably handle your own car accident claim. We wrote an extensive article on how to manage your own car accident claim here. However, even if you ultimately decide to handle your own claim, we still recommend that you seek out and consult with a car accident lawyer to make sure you are managing the process the right way. At The Hart Law Firm, we will meet with you for a free consultation to go over your situation, answer any questions you may have, and make sure you are handling your claim properly. There is no downside to consulting with a lawyer – it may end up saving you thousands of dollars in the long run and will cost you nothing. However, where you have significant bodily injuries, lost more than a week of work, and had significant property damage to your vehicle, in most cases you will more than make up the fee you pay to a law firm in an increased overall settlement. Would you rather have 100% of $10,000 or 2/3 or $30,000? Can we guarantee that you will recover more by hiring a lawyer? No, but we will guarantee that we won’t take a fee off of a settlement offer you have already received from the insurance company. In other words, if you are talking to the adjuster the week after your accident, and they offer you $10,000 to settle your claim, but then you hire our firm and 6 months later we are able to secure you a $30,000 settlement, then we will only charge a fee on the $20,000 we were able to obtain that is over and above the original settlement offer. Keeping you informed every step of the way and giving you peace of mind that you do not have to manage this process alone.